1. What role can congregations play in mitigating what Bill Bishop called The Big Sort? One of the principle sociological processes of the 21st century is our tendency to stay in lifestyle enclaves. In suburban rings, these show up as gated communities (whether real or imagined). In inner-cities, they look like ghettos (in the technical and historical sense of the term). This separation has significant consequences for social policy. This weekend, my friend Scott Emery posted a Washington Post article by Emily Badger (If you care about urban policy at all, follow Emily on twitter at @emilymbadger). Her article, titled “How our cars, our neighborhoods, and our schools are pulling us apart” summarizes work done by Robert Putnam in Bowling Alone as well as other works. The byproduct of such separation is a lessening in interaction even with those in our neighborhoods and a general sense of distrust of people in general. I shared the piece on Facebook with this question: “What would it take for the local congregation to be one place that counters this trend?” What if our churches were the places where people interacted with those different than themselves, shared meals, and actually shared lives? I was thinking of a research project I conducted in the early 90s. I had hypothesized that congregations played a key role in linking various voluntary associations within a community. I examined the social networks within three congregations as well as their associational memberships. I found limited support for my hypothesis, in part because I focused on bonding capital (friendship) instead of bridging capital (information flow and problem solving). I completely ignored Grannovetter’s “Strength of Weak Ties” that I’ve written about. If we put a priority on both bonding and bridging capital in the local congregation, we’d do a great deal to counter the dynamics we’re seeing in the news. Local churches could be key sources of revitalizing communities while living out the call as the Body of Christ. Emily Badger wrote another story about how the gentrification of urban areas can be a good thing if it means expanding jobs and services to previously isolated inner cities. If millennials are disproportionately moving to cities and inner suburbs, their local congregations might be key to transformation. That is, if they don’t all settle for non-church community. This was a theme I explored a couple of weeks back when I analyzed the 2007 Pew Religious Landscape study. In that post, I argued that you cannot really understand what it happening in evangelical and mainline religion by looking at membership apart from attendance. There are lots of folks who claim religious identification who rarely go to church and they shouldn’t be part of our calculations of what’s changing (or not) in the religious world. For example, the data on “church switchers” needs to take into consideration that 1 in 5 of those claiming a childhood faith rarely if ever went to church. To put this another way, it’s not just mainline churches who had “cultural Christians” — people who claimed religious identification but didn’t attend. This is significant to the whole “church decline” argument. If what we’re seeing is a shift away from casual membership, this is good for congregations. But it also means that what we used to see as the dominance of religion in society may have been substantially overstated. 3. Belonging is Prior to Believing. There are many who would argue this the other way around, that right belief is a condition for belonging. But I think that’s bad social psychology. We have a desire to be accepted for who we are and to work through our differences as a condition of remaining in a group. If we are not allowed to be ourselves and to ask legitimate questions we have, there are serious social costs that result which play out in a number of ways. I wonder how many church conflicts, power struggles, gossip sessions, and fights over music style are really about identity more than content. David Hayward shared this cartoon yesterday. 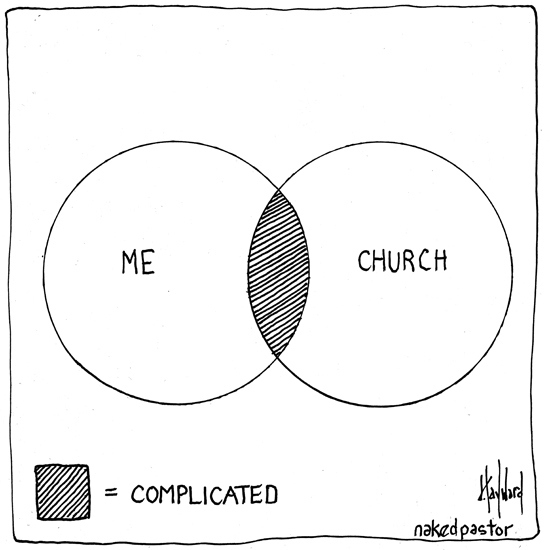 He explained that this venn diagram describes his relationship to the church. But I find it has a deeper meaning. If the left circle is who I am, then a small slice of me is allowed at church. Conversely, much of the work of the church has little impact on how I live my life. I’d label the overlap (which he labels “complicated”) as authentic identity. Consider the lessons shared in this piece from Leadership Journal yesterday. Oneya Fennel Okuwobi explained the steps involved in building a truly multi-ethnic congregation: 1) Take time to listen; 2) Empathize with Outsiders; and 3) Going beyond a veneer of peace. These aren’t just lessons for dealing with ethnic or racial diversity — they are the steps toward true community. The desire for community is not simply a millennial preference (although they may be less likely to hang around in its absence). This was the dominant theme in Church Refugees — those Done With Church simply couldn’t find the resources to keep going in the face of such denial of identity. This is the central theme I wanted to weave together but I realized that I really need help from people who are involved in ministry on a week to week basis. But it seems to me that if we wanted our congregations to be places that people invested in, that impacted their communities, and that made belonging central, we’d do some things differently. Perhaps we need to recognize the small group ministries are an admission that people aren’t at home in the congregation. They go to church and they “do life” in their groups. Why is this? What would it look like for us to do life on Sunday (making Hayward’s overlap a little bigger)? Two of the schools I’ve worked at have had cohort based degree programs for adults. When you go to commencement and hear people speak of their experience, you find that their loyalty resides with Group 23 and not with the institution. Have we done the same thing in the local church? I’ve been looking over some recent books by disaffected millennials. In seeing where they struggled with congregational life, we might gain insights into the questions we need to pursue (even if I’m not ready for answers yet). In Erin Lane’s excellent Lessons in Belonging, she shares some concrete ideas. e. Be genuinely interested in those with views different than our own (including those outside the church). We could have congregations that filled the void in our communities small and large. But to do so requires us to question our practices for this post-Christian society. Bolz-Weber said people shouldn’t take the Pew Research Center surveys showing fewer people are attending church to mean that they don’t care about Christianity anymore. That would be like saying because there are no phone booths, no one cares about talking on the phone anymore, or because there are no more Blockbuster stores, no one cares about being able to watch movies at home, she said. So what does it mean for local congregations like mine to rethink how we do what we do in the same way cellphones and Netflix have changed their respective dynamics? I don’t have answers worked out but I think I’m headed toward some possible answers.